Alveoli are an important part of the respiratory system whose function it is to exchange oxygen and carbon dioxide molecules to and from the bloodstream. These tiny, balloon-shaped air sacs sit at the very end of the respiratory tree and are arranged in clusters throughout the lungs. 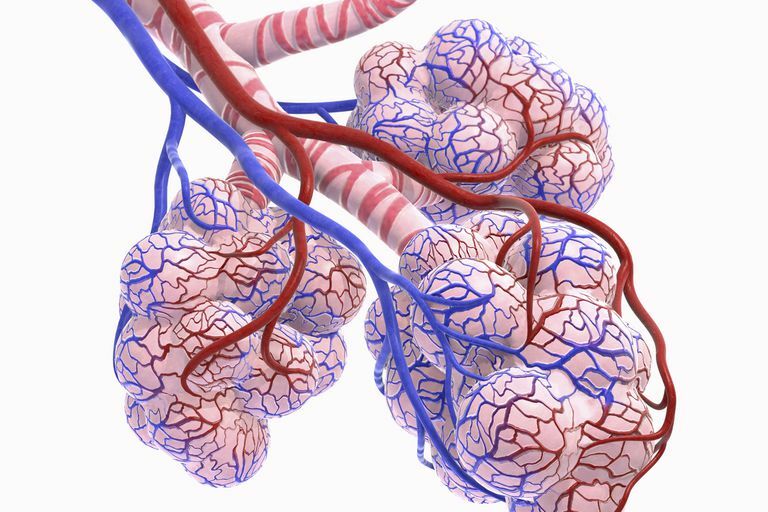 Alveoli are tiny balloon shaped structures and are the smallest passageway in the respiratory system. The alveoli are only one cell thick, allowing the relatively easy passage of oxygen and carbon dioxide (CO2) between the alveoli and blood vessels called capillaries. One cubic millimeter of lung tissue contains around 170 alveoli. While the total number can vary from one person to the next, there are literally millions within the human lungs spanning a surface area of roughly 70 square meters. Alveoli are the endpoint of the respiratory system which starts when we inhale air into the mouth or nose. The oxygen-rich air travels down the trachea and then into one of the two lungs via the right or left bronchus. From there, the air is directed through smaller and smaller passages, called bronchioles, past the alveolar duct, until it finally enters an individual alveolus. Alveoli are lined by a fluid layer known as a surfactant which maintains the shape and surface tension of the air sac. By maintaining surface tension, there is more surface area through which oxygen and CO2 molecules can pass. It is at this junction that oxygen molecules diffuse through a single cell in an alveolus and then a single cell in a capillary to enter the bloodstream. At the same time, CO2 molecules, a byproduct of cellular respiration, are diffused back into alveolus where they are expelled out of the body through the nose or mouth. During inhalation, capillaries expand as the negative pressure in the chest is created by contraction of the diaphragm. During exhalation, the alveoli recoil (spring back) as the diaphragm relaxes. There are a number of medical conditions that can directly affect the alveoli (that we refer to as alveolar lung diseases). These diseases can cause the alveoli can become inflamed and scarred or cause them to fill with water, pus, or blood. Pneumonia is an infection that inflames the alveoli in one or both lungs and can result in the air sacs filling with pus. Tuberculosis is an infectious bacterial disease characterized by the growth of nodules in the tissues of the lungs. The disease primarily infects the alveoli as bacteria are inhaled, causing the formation of pus in the air sacs. Bronchioloalveolar carcinoma (BAC) is a form of lung cancer that is now instead considered a subtype of lung adenocarcinoma. These cancers begin in the alveoli and are often found diffusely in one or both lungs. Acute respiratory distress syndrome (ARDS) is a life-threatening lung condition that prevents oxygen from getting to the lungs as fluids begin to accumulate in the alveoli. ARDS is common in critically ill patients. Respiratory distress syndrome (RDS) is seen in premature babies whose bodies have not yet produced enough surfactant to line the alveoli. Pulmonary edema is a condition caused by excess fluid in the lungs which collect in the alveoli and can lead to respiratory failure. As a single risk factor for lung disease, tobacco smoke is known to affect the respiratory tract at every level. This includes the alveoli. Alveoli are made up of collagen and elastin which provide the sacs their elasticity. Smoking damages both of these, causing the sacs to harden and thicken. Smoking also actively dilates blood vessels, impeding the exchange of oxygen and CO2. Cigarette smoke also affects how the alveoli work, causing damage right down to the molecular level. It disrupts our body's ability to repair itself as it might following an infection or trauma. As such, the alveolar damage is allowed to progress unhindered as the lungs are persistently exposed to toxic fumes. The alveoli provide one of the most important functions our bodies perform. They're the gateway through which oxygen enters our bloodstream and the primary way in which some of the waste products of metabolism (carbon dioxide) exit the body. Diseases which affect the alveoli can result in reduced oxygen being delivered to the tissues of our body, and consequently, may result in damage (due to hypoxia) to every major organ. Hsia, C., Hyde, D., and E. Weibel. Lung Structure and the Intrinsic Challenges of Gas Exchange. Comprehensive Physiology. 2016. 6(2):827-895.